Another quick post today, and a bit of a fluff post really because it’s a salad. More than a recipe, today’s post is a reminder to include a salad on your Thanksgiving table! If y’all are anything like me, I get lost making a huge menu full of oozy, gooey, creamy and indulgent dishes. It seems that a Thanksgiving dish by definition should include a pound of butter and double that of sugar! I remember one year, I tried remaking my husband’s family’s sweet potato casserole with a bit less butter and sugar. It didn’t work; it just didn’t taste the same and so the following year, I went back to the original recipe. Back in Texas, for many years I was the sole cook for Thanksgiving dinner and there, I didn’t bother with a salad after the first year where everything finished except the salad! I knew it just wasn’t worth the effort with my extended family. Now that the children are older and they all love salad, we finish it with no problem. The biggest salad eater is actually Laith, my 8 year old. He absolutely loves salad and he was the recipient of the salad that was photographed. I thought that I would go ahead and post the salad I will be making for our dinner tomorrow evening. You may have all the ingredients needed in your fridge already and so it will be easy to throw together. If you don’t then just put together a salad with stuff you have. Like all salads, this one is versatile and open to substitutions, like I said, it’s only to inspire! I wanted to use seasonal fruits and vegetables, and then have a nice, tart dressing to go with it to cut the richness of the other dishes. Some crunchy, sweet and cinnamon-y sugared hazelnuts completes the festive Spinach, Beet and Pear Salad with Pomegranate Vinaigrette. My photographs show a composed salad because I didn’t want the beets to colour the whole thing pink. Tomorrow, I’ll be layering it and placing the beets last on top. The sugared hazelnuts, or any nuts of your choice can be store bought if you happen to have some in your store cupboard, but they are very easy to make and there are many recipes out there. I used this recipe and just adapted it with my nut of choice. Delicious fall salad with a tart pomegranate vinaigrette and sweet, cinnamon sugared hazelnuts. Arrange the salad on a plate and drizzle the dressing over the top. Sprinkle over the candied nuts. Whisk the molasses, honey, lemon juice together and drizzle in the olive oil. Taste for salt, pepper and sweetness, adjust as needed. I used pomegranate molasses for the vinaigrette which you may or may not have. You could always sub with juice. The molasses does make a thicker, sweet tart vinaigrette. So, since I love to know what everyone is cooking, what’s on your table tomorrow? I’ll start. I mentioned we were having a pot luck at my house with some great friends and we’re all cooking something different. My dishes are: creamed corn, sweet potato casserole, mashed potatoes, stuffing and this salad. I also have a few desserts; a pumpkin cheesecake tart, pecan pie and a banoffee pie. My friends are bringing turkey, gravy, cranberry sauce, asparagus, cauliflower cheese, potato wedges, green beans, buckeyes, dinner rolls, flan and fruit tart! We will be very thankful for our incredibly wonderful meal. I would like to wish my US readers and friends a very Happy Thanksgiving, and Happy Hanukkah to my Jewish readers and friends. I love the sound of this pomegranate vinaigrette…and yes, what a beautiful plate…love the colors in this salad. Thank you Juliana! It turned out really well and was a hit at dinner. This salad is beautiful and just what we need at the holiday table to balance out all the creamy, heavy stuff! I’ve never had candied hazelnuts and being that I love hazelnuts, I really want some! I adore all the fresh flavors and components here. You’ve reminded me to put something like this on my Christmas menu. Monica recently posted..Nutella-hazelnut crinkle cookies…’Tis the season! Thanks Monica! The hazelnuts were so good! Great to munch on as a snack too. Beautiful salad. Nice and refreshing and I love all the ingredients. Love the pomegranate molasses in the dressing. Thank you! It did brighten up the table with the vibrant colours and I guess it tasted good because it was all gone! How I love such salads! There is so much beautiful fresh color in this post here, thanks for the colorful cheer! Thank you Pamela! I love bright, vibrant salads! Lucky of you to have a kid who loves greens 🙂 And that is a gorgeous looking salad, so even non eaters will finish it off, no problem. I hope your Thanksgiving meal was as beautiful as it sounded. Thank you. Minnie, yes it was a success! We had a great spread and the salad; all finished!! With a wonderful blend of tart and sweet dressing I can eat salad everyday. I have all the ingredients but not the pomegranate molasses. Will try with juice. Thanks Bal! It turned out really well and everyone loved it! Wow Laith likes salads, that is so nice that a kid loves his greens. This is a salad I love. The hazelnuts are just a great touch to a beautiful salad. I am sure you all are having a busy time preparing and can’t wait for evening. HAVE a great thanksgiving and little one a hug. ENJOY. Thanks Asha! We had a great time and the food was amazing. I hope yours was good too. Yes, sugared hazelnuts could convince me to eat a salad LOL. Thank you Sowmya! Thank you very much for your comment! Lucky Laith! This sounds like a great salad and an incredible feast. Have a very wonderful thanksgiving, Nazneen! I want the hazelnuts!!! Thanks Abbé! I hope you had a great one too, and Hannukah and your anniversary!! Such a beautiful salad, Nazneen. With those ingredients, it is so much more than a green salad and certainly worthy of a place at your Thanksgiving table. I like, too, the sound of your pomegranate vinaigrette and I bet it is the perfect dressing for this salad. Thank you very much John! It was a wonderful gathering and we all had a great time stuffing our faces! The salad was a hit and the only thing that wasn’t left over! I’m fine with salad! People eat so many root vegetables here in winter… I feel like I’m on a carb and root-veg overload right now. Feel myself yearning for fresh flavours. This looks amazing Nazneen… love the look of the pomegranate vinaigrette too – something to try for sure! Thanks Charles! I think we overload on root veg here too. Stews and soups and casseroles. Ugh, feel so heavy and weighed down sometimes. Salad is nice for a change, but I have to say, cold doesn’t make me want to eat salad! Thanks Uru! It was nice and tart and sweet as well! Lovely salad! I’ll take beets anytime in anything. Happy Thanksgiving! Thanks John! Happy Tday to you too!! Nazneen, what an elegant presentation for your salad – so many fresh and healthy components. Pomegranate molasses is easy to find in stores around here and I know that it adds a wonderful flavor to vinaigrettes. Beets, pears and spinach sound like a delicious combination and I really like the addition of the sugared hazelnuts – a very nice touch! Hope you will have a wonderful celebration with friends and family tomorrow! My dear Andrea, thank you for your lovely comment. It’s the fresh components that I was trying to bring to the table. I find that the Thanksgiving table tends to weigh under the richness of the cooked and baked foods. We have casseroles and bakes and sautes, all cooked in butter and cream. I figured this would cut through the richness of it all, especially with the tart pom molasses. Thank you Andrea. Wishing you a lovely weekend. What a beautiful salad! Wow. Happy Thanksgiving to you and your family Nazneen. Thanks Le Ann! Happy Thanksgiving to you too! Nazneen – this is probably the most beautiful presentation of salad I have ever seen, and I can’t imagine it any other way! I always serve salad for Thanksgiving (for the same reasons you mention) and get into the rut of a simple green salad, usually with avocado… This will be such a great change although, as I am not hosting this year, for the day after. How could you NOT make the candied hazelnuts? Just wonderful. Thanks David! That’s very sweet of you to say, though I know there are some very pretty and awesome salads out there 🙂 I still appreciate your comment 😉 Nice that you can be the guest this year! I don’t mind hosting, since the cooking is divided it’s been quite relaxed. Happy Tday David! I could eat this salad every day! Pure perfection! Thank you Mimi for your lovely comment! Thank you Charlie! I am sure we will be stuffed with all the great food and most of all thankful for the company of good friends. Young children are always easy to feed I think. It’s as they start getting older that they become difficult. I doing have so much of a problem except for my vegetarian, who I have to make separate things for, but it’s ok for the most part. What a great idea a salad is – I love yours with the beets and that pom vinaigrette! We usually get together s a family for Christmas so this year thanksgiving is just my daughter and i and we are just having sweet potato/pumpkin/pecan/orange souffle-type dish and roast chicken! shashi @ http://runninsrilankan.com recently posted..WIAW or actually, WIMW (What I Made When) Thanksgiving was on the Horizon! Thanks Shashi! Honestly, I don’t like turkey so I always make some chicken for myself! So, a friend is making chicken for me tomorrow, that’s what I’ll be eating! Your soufflé sounds pretty darn yummy! I have to head over and read your post. Happy Tday! Now I want to know how do you eat it all!!!!! Sounds amazing. Ive never eaten sweet potato casserole, have you posted the recipe? Believe me, we manage! Actually, you take like a spoonful and then you enjoy leftovers for days!! Thankfully, this time I have friends to share the leftovers with and won’t have to eat them for days on end!i haven’t posted that casserole recipe simply because I eat it once a year. I hate making it to eat it so close to Tday and then making it again. If you want, I’ll email the recipe to you. Maybe you can make it for Xmas. That looks like a lovely salad! Happy Thanksgiving! We are just starting on Christmas planning in Australia, and your salad will probably be on our holiday table. Thank you so much! I like the colourfulness and it looks festive on the table. Can’t wait to see your Christmas posts! 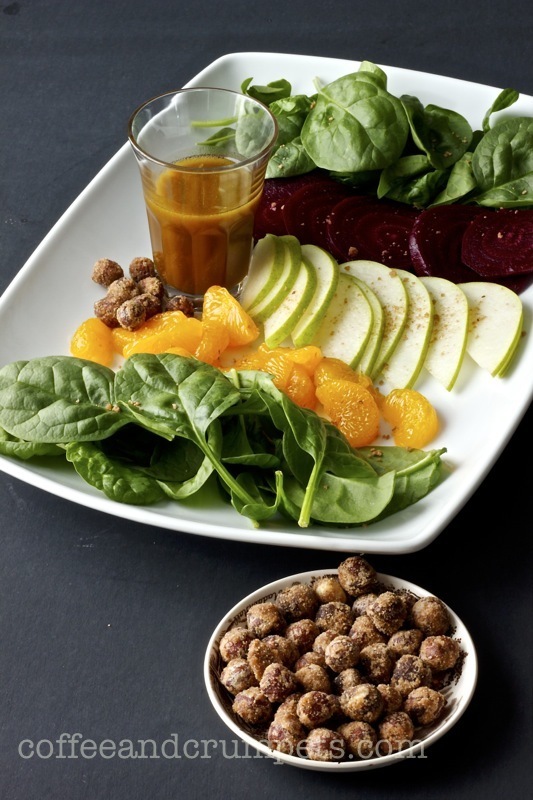 Need to try this pomegranate vinaigrette. Thanks Dan! It’s pretty tart but good, perfect for heavy foods like on Thanksgiving. How wonderful! Just reading about your platter is making me hungry and excited at the same time. I don’t have a Thanksgiving celebration and my husband is travelling so it’s pretty boring this side. Like you, I love to add a surprise element in my salads and the cinnamon sugared hazelnuts are a rocking idea. I think most if not all celebrations call for a ‘pound of butter and double the sugar’ which is what I LOVE:-) Great use of seasonal ingredients in the salad…I bet it will be polished off. Have heaps of fun Nazneen! Thanks Sonali! Oh it’s hard when you’re by yourself with the kids. Everything seems so undoable and hard! And I definitely agree about holiday food, even for our holidays, they are so fattening! But then again, it only comes around once a year but if you start counting all those once years x 3, yeah, that’s a lot! !